UKZAMBIANS is hosting annual lecture series in London in honour of the first President of the Republic of Zambia, Dr. Kenneth Kaunda. The lecture series will invite distinguished speakers from around the world to discuss leadership principles used by Dr. Kaunda and his important role in the struggle for independence of Zambia and that of other neighboring African countries. The Lectures will highlight the legacy of the Kaunda era that was characterized by the peace and stability Zambia continue to enjoy, his smooth transition of power following defeat in the 1991 general elections which has inspired other African countries making Zambia a model of democracy in Africa. 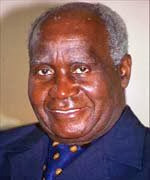 Dr Kaunda has continued to receive numerous accolades in recognition of his political and social achievements.